Back Stage with California Contemporary Ballet gives you an inside look into what it's like to be part of this remarkable company, and the lives of the dancers who make up the ensemble. This week, we get up close and personal with CCB's Laura Smith Mauldin. What made you decide to start taking dance classes? My mother could never get me to hold still as a kid, so she enrolled me in dance classes at age 6. I've been hooked ever since. Any moments, events, films or performances that inspired you to pursue dance as a career? Working with Jodie Gates on the re-staging of William Forsythe's "Artifact Suite" definitely gave me a sense of accomplishment. The fact that I was cast by Jodie made me think that I really had a chance to be a professional dancer. Where did you train? Any memorable teachers or programs? I trained at the University of California, Irvine, Moorpark College and California Dance Theater. While at CDT, I loved taking class from Stanley Holden. He kept me coming back to dance class while I was busy as a competitive ice skater. What’s your favorite style of dance to perform? Ballet! It's what comes most naturally to me; I love the elegance and the grace. Although, I also love to do things that are strong and dynamic too, such as modern dance or modern-ballet-fusion. What do you feel is the biggest challenge of being a dancer in Los Angeles? California is so big that it adds a new challenge because everything is so spread out. You could have gigs in places that are two hours away in opposite directions, not like New York where everything is so close. And the traffic-- Oi Vey! When did you join CCB? I did a dance festival with CCB in January 2009, but officially joined CCB in the summer of 2009. What has been your favorite piece to perform with CCB? Playing the role of Gerda in last December's production of "The Snow Queen" was by far the most fun. I got to be onstage the whole time and I loved her range if emotions: happy, worried, frustrated, defensive, and above all determined. Gerda and I merged personalities very easily. 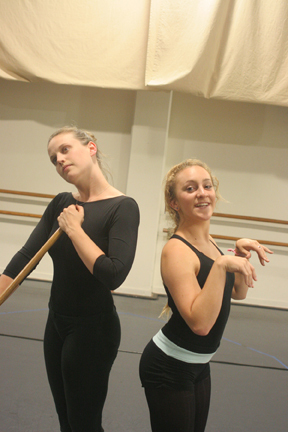 Right: Laura partnered by Filip Stanek in The Snow Queen. "Predea" is probably the most challenging piece and there is definitely a love/hate relationship there...It's a fantastic piece, but it kills me! Why do you dance? What keeps you going with it? I dance because I love it. I love moving and performing. I get excited over any performance whether it's at the Pasadena Civic Center or in a mall somewhere. I just love to dance for people. I could be anywhere in five years. I could be a mom, I could be in culinary school, I could be dancing for CCB, I could be teaching....any combination of any of those things is possible! Any advice for young dancers just starting out? If you love it, go for it! Don't ever let anyone tell you you can't dance. But make sure it's always fun, it's supposed to be fun! Do you have any pre-performance rituals or superstitions when you’re backstage? I like to be quiet in my own mind right before I dance. I visualize my choreography and go through the emotions of the piece in my head. I definitely practice anything that is tricky for me before-hand. And I always make sure I take off my jewelry! Meet all the members of CCB each week here on the CDA blog and for upcoming performances and more information visit CCB's website. Come see as our troupe of ten young dancers tackle pieces that are at once classical and unique, traditional and avant-garde, sentimental and fun! As a company, CCYBallet breaks through the boundaries of classical ballet and presents a show that is fresh, new, and incredibly inspiring. Featuring the works of Harald Lander, CCYBallet co-directors Jaclyn Stryker and Heather Toner, and California Contemporary Ballet Artistic Director, Erin Holt, “DanceScapes” promises to engage and excite all who see it! Showcasing the talent and diligent work of CCYBallet, "DanceScapes" manages to invoke hope, convey dreams and the capture the beauty of ballet in this one-of-a-kind production that simply can’t be missed! Sunday June 13 at 2:30. Get your tickets now for California Contemporary Ballet's new show, Uncaged. Featuring the premiere of five new choreographed works by Erin Holt and her dancers, revealing the nature of the human condition. Joined in Concert by Three Top L.A. Companies! CCBallet- Uncaged will feature two new works created to the musical compositions of Mr.Dwight Mikkelsen and Lighting Design by Bosco Flanagan. DRC discount at child rates when calling 818-790-7924. California Contemporary Ballet (CCBallet), established by Erin Holt, the company’s visionary choreographer and Artistic Director, is one of Southern California’s burgeoning dance companies. CCBallet offers self produced concerts featuring the original innovative choreography by Ms. Holt as well as renowned guest choreographers and distinguished visiting artists. Their performances highlight CCBallet’s career dancers, embellished by beautiful handmade costumes, sets and lighting design. The company often presents the works of original music by guest and resident composers. California Contemporary Ballet, serving as the non-profit fiscal sponsor of La Lupa Italian Cultural Arts Festival, will perform in the Festival's Teatro Programme May 16. La Lupa Italian Cultural Arts Festival is a two-day, non-profit arts festival designed to broaden and enrich the LA community by increasing audience exposure to contemporary Italian and Italian-American art, culture and heritage. California Contemporary Ballet, (CCBallet) is proud to be a non-profit fiscal sponsor of the La Lupa Italian Cultural Arts Festival. Founded in and dedicated to the art of classical and contemporary dance, the mission of CCBallet, is to educate and provide inspired theatrical experiences for dancers, the community and Southern California. LA LUPA FEST is honored that CCBallet has chosen to be their official non-profit fiscal sponsor and is excited that CCBallet will also be performing in their Theatrical Teatro Programme. The LA LUPA FEST's Teatro Programme will be held Saturday, May 15, from 8:00-11:00pm and Sunday, May 16, from 7:00-10:00pm. Tickets are $20.00 at the door and $15, if purchased in advance (online purchase). Children under 10 are free. Tickets can be purchased at www.lalupafest.eventbrite.com. Being a male dancer means battling many stereotypes. But the rewards of my job are limitless. My business attire is a pair of tights. All right, there it is. I wear makeup onstage, and some of my colleagues are gay. Can we move on now? Can we leave behind the tired male-ballet-dancer stigma—that ballet is not a masculine pursuit—in order to move toward an appreciation of the athleticism and artistry involved in this line of work? On an average day at the job, I handle lithe, lovely women, engage in duels and delight in the experience of an exotic locale. I move like a gymnast or martial artist and embody the vilest of pimps or the most chivalrous and passionate of lovers. I constantly expand the borders of my physical capabilities, and I hone my mind to a quick-learning, focused edge. Come 8 p.m., I'll fuse dynamic movement and storytelling with the grandeur of a full live orchestra. Yes, I'm proud of my profession. Yet I find myself slightly guarded when I tell people what I do. Like some sort of incurable blight, the male-dancer stereotype has taken root and metastasized in our cultural consciousness. Pioneers like Baryshnikov or Nureyev might have opened some minds, but their days have long passed, and despite the noble efforts of a handful of current ballet leaders to expose fresh audiences to our art form, a whole new generation looks at male dancing with skewed vision. Some of my peers are foreigners; in many other countries male dancers are held in higher esteem. I studied in Russia for a year and always marveled at the way Russians celebrated their artists, whether their medium was dance, music or the written word. But I'm American, and I want to live in my own country, as a dancer, with some respect. The most irritating aspect of the male-dancer stereotype is the underlying insinuation that we in some way lack strength of character or a courageous spirit. Male and female, all dancers undergo strenuous training from a very young age, and constantly wrestle with injuries and fatigue. But male dancers must possess a special type of will and fortitude if they are to become professionals, for, like fish swimming upstream, we have to fight through the current of thinly veiled contempt that much of society harbors for our chosen path. In our culture, girls are encouraged to take ballet; boys receive no such endorsement, except of course from ballet teachers or exceptionally supportive parents. The boy who perseveres in dance must have a genuine hunger for it, must be uniquely motivated and dedicated, and must develop a truly thick skin. I started taking ballet when I was 5. My open-minded parents thought it was a good way to channel my rambunctious behavior. A few years later I was hooked. I loved the physicality and, of course, the girls, but I also learned that not everyone recognized the value of dance the way I did. I don't remember the first fight I got into for being a kid who took ballet, but I remember fighting a lot before I realized that maybe I should keep my extracurricular activities to myself. But ballet was rewarding enough to be worth a fat lip or a black eye, and I emerged from my years of dance training more focused than ever. My background is not unusual among my American colleagues—they share similar stories of discouragement, harassment and even violence. But these experiences served to harden resolve and develop courage, and I know I can always count on several of my dancer buddies for steadfast support—they got my back! Ironically, the stereotype of the sissy male dancer has given rise to a male dancer who is anything but. It's frustrating that I feel obliged to extol the virtues and describe the rigors of my profession. I'd just like to make it known that the path of the male dancer isn't necessarily easy—as with any truly worthwhile endeavor—but the rewards can be limitless. I feel lucky to have discovered a vocation that has allowed me to glimpse the great depth of human potential, both physical and mental, and has given me the opportunity to bring joy to so many people in so many places. I feel there is honor in the arts, in the world of dance, in the realm of male ballet dancing. Exposure to ballet is all that is needed to open minds, for the combination of athletic movement, ardent drama and beautiful music can instill a profound appreciation in an audience. But for you out there who still feel compelled to malign male dancers with half-truths and petty stereotypes, well, maybe we need to step outside. I'll leave my tights on. Radetsky lives in New York City. the opportunity to learn male specific movements, tricks and techniques. It’s a must for any aspiring male dancer. Click HERE for more information. La Canada, CA: California DanceArts (http://www.caldancearts.com) a long-established dance academy in La Canada, announced that Lynn Pittenger, former ballerina with the New York City Ballet, has joined their teaching faculty. Ms. Pittenger, has been a recipient of two Ford Foundation Scholarships, one to study with the San Francisco Ballet Company and the other personally awarded by Mr. George Balanchine to attend the School of American Ballet in New York City. It was while attending the New York school that Maria Tallchief selected Ms. Pittenger to perform in lecture demonstrations throughout New York and eastern colleges. After two years of study at the School of American Ballet, Lynn was invited by Mr. Balanchine to join the company of New York City Ballet where her professional career began. 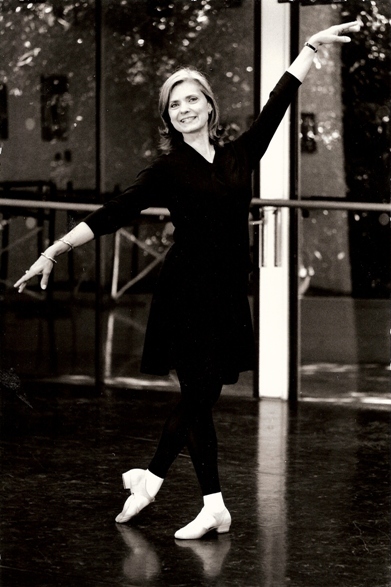 In addition to a successful performing career, Ms. Pittenger directed a very extensive program for over 250 children in the course of 23 years and ran her own school of ballet for over seven years. Since 1987, California DanceArts has been dedicated to the purpose of grooming and nurturing the talents of beginning to serious career dance students. The school has established a reputation as a career preparatory school for dancers transitioning to the professional level. Its current location in beautiful La Canada is nestled among several schools and recreational facilities. The school provides three large studio spaces featuring sprung floors designed to prevent injury, 20-foot high ceilings geared for unobstructed jumping, wall mirrors and air conditioning. Director Erin Holt also runs California Contemporary Ballet, a dance troupe that puts on several original ballet productions per year, including the Snow Queen (www.snowqueenballet.com), an original ballet with an original music score. This show is put on every December and recently completed its 12th season. California DanceArts also is offering several dance intensive workshops for various levels in summer 2010, and more on these can be seen at www.danceallsummerworkshops.com. The school’s blog can be seen at http://caldancearts.typepad.com. For more information about California DanceArts and the programs offered by the school, call 818-790-7924, or visit the school online at www.caldancearts.com. Back Stage with California Contemporary Ballet gives you an inside look into what it's like to be part of this remarkable company, and the lives of the dancers who make up the ensemble. This week, we get up close and personal with CCB's Ryan Morrison. My mother thought I had too much energy, and she always loved dancing so she enrolled me in classes when I was seven and I've been dancing ever since. I find it's not one performance or another. When I watch dance it makes me want to get up and join in. So pursuing dance as a career made sense. California Dance Arts is where I have done the majority of my training. But I have also danced at a few different camps over the years, giving me the opportunity to travel and train in Salzburg and the Czech Republic. I don't have a favorite particular style. I would have to say my favorite thing to perform is something with a storyline. I really enjoy acting as well as dancing, so putting them together is super fun. How little opportunity there is for work. Most dance in L.A. is back-up, booty-shaking or hip hop. Ballet just isn't very popular in L.A. I joined CCB when I was nine as a junior member, back when it was called "Dance Street Performers." And I've stuck with 'em while the company evolved from a group of young kids to a professional dance company. Although it was murder, I think Blind Journey is still one of my favs. Girls...no, just kidding! There is a certain amount of communication you can deliver using your whole body which you can't do in the other arts. Being able to do that (communicate) to an audience is one of the best feelings. I guess performing is what keeps me going. I don't really know, hopefully still dancing. Well for guys...STRETCH! Flexibility is one of the hardest things to achieve the older you get. Well, if I am partnering I like to do all of my warm-ups with the person I am working with and I have to listen to some jamming music to get me pumped up.